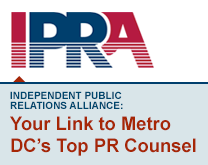 The Independent PR Alliance is sponsoring a program on April 4 from 11:30-1:30 in Northern Virginia that will offer ideas for getting your news in traditional and digital media. In the evolving media world with shrinking newsrooms and expanding digital outlets, it can be tricky to navigate getting good and relevant press for your clients. During the “Getting Ink: Secrets to Pitching a Great (Traditional or Digital Media) Story” session, you’ll get inside advice from veteran editors representing two national outlets about how to work with their organizations to get noticed. Also both of the panelists focus on the DC region, providing perspective on how to get press in arguably one of the nation’s toughest media markets. Featured speakers will be Gwen Flanders, USA Today and Arin Greenwood, Huffington Post.